Do You Make the Same Mistake that Plagues 96% of Golfers? The pros make it look easy to swing the golf club correctly, propelling that beloved little white ball down the fairway, resulting in an 80 or 90 score. But frustration often begins to set in after a few practice sessions and things aren't as picture perfect as we all imagine. The ball can appear to have a mind of it's own and to most, it's difficult to establish exactly why it behaves the way it does. If you often feel like this blue man on the right. Don't worry, you're not alone! Even if you have several years of experience and you're good enough to impress your boss (or your cat), there's a good chance that you struggle from time to time with the issue that plagues over 96% of golfers. 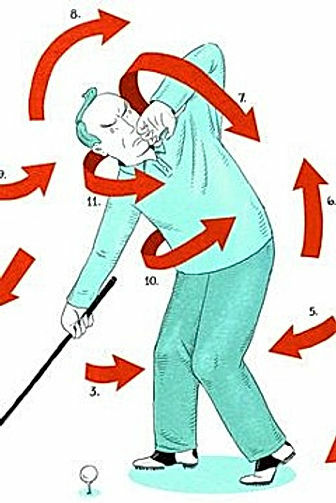 This article is the third of a three-part series about how to stop your golf ball from flying to the left. If you missed the first two parts, don’t worry! You can jump in here and go back to check out parts one and two after you’ve practiced the tip in this article! One of the big issues that causes your golf ball to fly high to the left is when you swing your golf club "over the top," and approach the ball with an outside-to-inside trajectory. Let's dive further into the details of how this happens. As you transition from the backswing into the downswing, there is a natural tendency to allow your club to make a circular motion in order to change the inertia of the club from backward to downward. This forces the head of the golf club to swing over your head instead of behind you, and alters the angle of your club to be too steep. The steep angle of the club in the downswing forces the club head to move over and down instead of just down toward the ball. This results in a circular motion and your club moves with an outside-to-inside trajectory. The more common issue that golfers struggle with is allowing the club to drift to an outside entry path toward the ball. Sometimes this mistake happens because you're accelerating too late, and sometimes it just happens if you're not paying attention. Either way, the effect is that your ball will fly sky high and left of your target. The last issue that may be sending your ball high and to the left may be that you're accelerating your swing too late. This isn't too difficult to fix, so this is the shortest tip of the group. You may just need to pay more attention to where your acceleration happens and practice accelerating correctly until it becomes muscle memory. It’s easy to get excited and accelerate too early or be too cautious and accelerate too late. Hopefully, this series of articles about fixing the outside-to-inside swing has given you some ideas to help perfect your golf swing and keep the ball on-line with your target. For more resources and help with your golf swing, please visit us at www.SwingCoachClub.com and select the ‘Lesson Tee’ tab. You'll find professional tips and instruction from Golf Digest Top 50 instructor and former tour coach, Dean Reinmuth. You can find his 60 second Quick Fix to the outside-in swing at the link below… check it out! If you haven't already, get yourself a Swing Coach practice club! Get immediate feedback on your golf swing and join the thousands of others who are perfecting their golf swing this season with the Swing Coach Club. With just 15 to 30 minutes of practice a day, you'll develop greater consistency, accuracy, and more distance at every hole! If you can’t make it to the range, the Swing Coach is even safe to use inside or in your backyard with the Sci-Core real-feel practice balls. The Sci-Core practice balls are the heaviest practice balls on the market, which means they give you the real-feel of an actual golf ball, but the soft exterior makes them safe inside your home or garage. We don’t recommend doing this but we have even tested them against our windows and TVs! Make your warm-up and practice the most effective possible by adding the Swing Coach practice club to your golf bag today and enjoy your very own personal Swing Coach! How real golfers have used the Swing Coach to quickly fix some of their toughest challenges!